(uv)-coverage (left) and polarimetric RadioAstron image of 0716+714 (right) made on January 3-4, 2015 at 22 GHz, using uniform weighting. Credit: Kravchenko et al., 2019. Using Russia's Spektr-R space telescope (also known as RadioAstron), astronomers have conducted high-resolution observations of the blazar S5 0716+71. The results of these observations, presented in a paper published February 12 on the arXiv pre-print server, provide insights into the structure of the blazar's jet. Blazars, classified as members of a larger group of active galaxies that host active galactic nuclei (AGN), are powerful sources of emission across the electromagnetic spectrum from radio to very high-energy gamma frequencies. Their characteristic features are relativistic jets pointed almost exactly toward the Earth. In general, blazars are perceived by astronomers as high-energy engines serving as natural laboratories to study particle acceleration, relativistic plasma processes, magnetic field dynamics and black hole physics. Therefore, high-resolution observations of blazars and their jets in different wavelengths could be essential for improving the understanding of these phenomena. BL Lacertae objects (BL Lacs) are a type of blazar showcasing lower-power jets and higher Doppler factors than other blazars. S5 0716+71 is one of BL Lacs known for its extreme variability across the electromagnetic spectrum, including the so-called intraday variability (IDV). While the IDV phenomenon still baffles scientists, there is evidence that it is being produced by processes intrinsic to the relativistic jet. S5 0716+71 is currently one of the best candidates for having an intrinsic origin of the observed IDV. 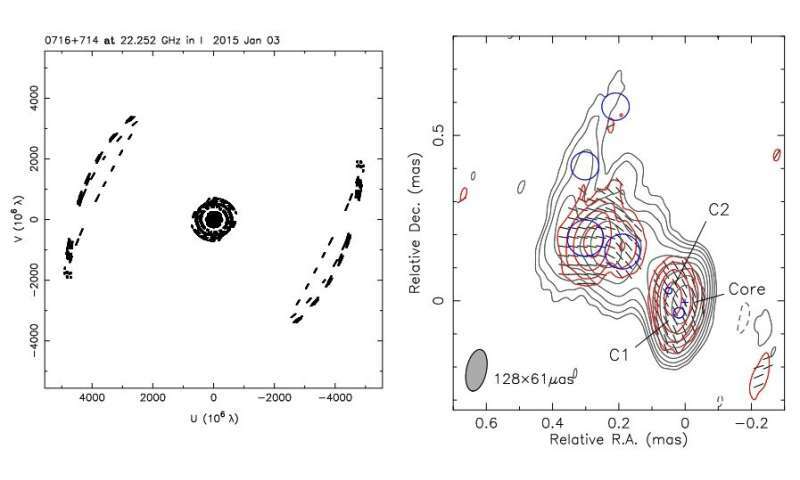 Hence, a team of astronomers led by Evgeniya V. Kravchenko of Astro Space Center of Lebedev Physical Institute, Russia, decided to use Spektr-R to investigate S5 0716+71's jet structure at the finest angular resolution and to investigate the origin of its IDV. "Here, we report on RadioAstron observations of the BL Lac object S5 0716+71, performed in a framework of the AGN Polarization and Survey Key Science Programs at 22 GHz during 2012-2018. We obtained the highest angular resolution image of the source to date, at 57×24 μas," the astronomers wrote in the paper. Spektr-R's 10-m radio telescope (SRT), with angular resolution of about 7.0 microarcseconds (μas) at 1.3 cm, allowed Kravchenko's team to find essential information about S5 0716+71, especially regarding the structure of its jet. The observations revealed a complex bent structure in the central 100 μas core region, consisting of an unresolved core and two nearby components, designated C1 and C2, located at approximately 41 μas and 58 μas from the core respectively. The size of the core was estimated to be not greater than 60 μas, while C1 and C2 have sizes of around 32 and 19 μas respectively. According to the paper, S5 0716+71's jet initially extends towards the south-east, at a position angle of 153 degrees, followed by a sharp bending of about 95 degrees towards the north-east. The jet maintains that direction for about one milliarcsecond (mas) until another sharp bend towards the north-west is observed on the images provided by SRT. The researchers detected linear polarization in the core and jet areas at the projected baselines up to about 5.6 Earth diameters. They also obtained the observed brightness temperatures in the rest frame of the source, which turned out to be greater than 22 trillion K for the core, at a level of about 699 billion K for C1, and around 1.2 trillion for C2. In concluding remarks, the astronomers underlined that in the case of S5 0716+71 the intrinsic processes in jet can explain its variability on the time scales of a days to week. They added that their study confirms Spektr-R's powerful capabilities to investigate relativistic jets in the vicinity of central black holes. More information: E. V. Kravchenko et al. The jet of S5 0716+71 at μas scales with RadioAstron. arXiv:1902.04369 [astro-ph.GA].